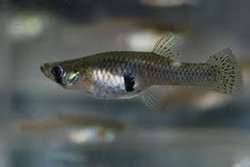 Gambrusia or “Mosquito fish” are a favorite of those with DWC or raft systems. Eliminate mosquito breeding in your troughs or settling tanks by introducing these fish which eat mosquito larvae. This entry was posted on Wednesday, January 9th, 2013 at 6:46 PM	and is filed under Hydroponics / Aquaponics. Both comments and pings are currently closed.